This dish takes a degree of patience but it’s well worth it. Occasionally it’s nice to make something a little more involved. I’ve used trout, a freshwater fish I often eat in the summer. (I don’t know why it feels so English and summery, it just does.) Prepare the terrine the day before so it has plenty of time to set, and buy the best crusty bread to serve it with. Heat the oven to 180°C/160°C fan/ gas 4. While the trout is cooking, cook the eggs for 6-7 minutes in a small pan of boiling water. Drain and cool. When the trout is cool enough to handle, carefully open the foil parcel, taking care not to spill the buttery juices. Remove the skin from the fish (discard), then flake the flesh into a bowl, discarding any bones. Add the butter and roasting juices from the fish to the bowl with the crème fraîche, capers, chives and lemon juice. Peel and roughly chop the eggs and add to the bowl. Season, then gently combine – you don’t want to break up the fish/eggs much. Lay the smoked trout on a plate or board. Finely chop the remaining dill, then sprinkle over the smoked trout to give it an emerald green covering. 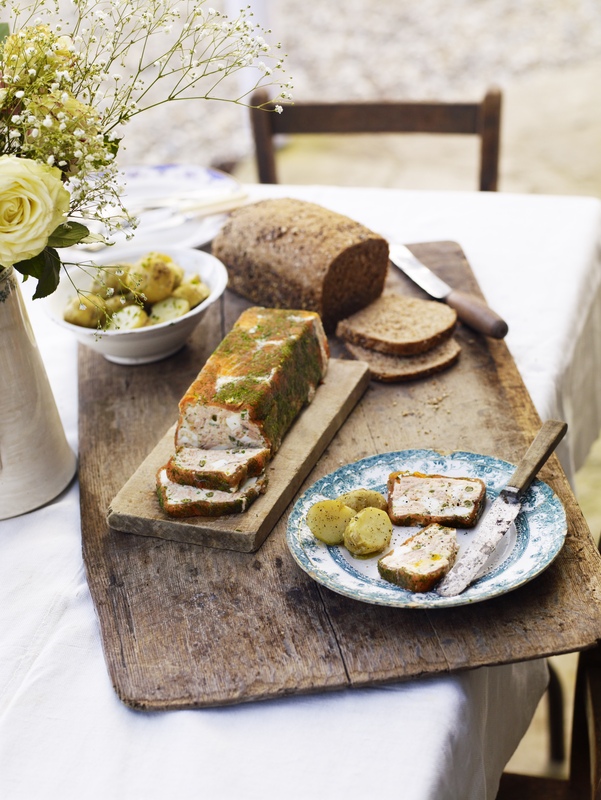 Line the terrine with the smoked trout slices, laying the dill-covered side against the cling film-lined tin. Spoon the cooked trout and caper mixture into the lined terrine and even it out as best you can. Fold over any overhanging smoked trout to encase the filling completely. Fold over the overhanging cling film, then chill for 3-4 hours to set.